In September 2013, he joined International Medical Corps and become one of their first responders, to help raise awareness before the disaster strikes by strengthen of communities. He participated in a charitable auction Go Go Gala, organized by GO Campaign and bought a cello made out of recycled material, at $5,600 on 15 November 2013. ^ a b "Robert Pattinson: Cancer Bites". 2011-08-10. Retrieved 30 December 2013. ^ "Poster for LOVE & DISTRUST "Starring" Robert Pattinson, Robert Downey Jr., and Sam Worthington". Collider. 2010-11-07. Retrieved 26 February 2013. ^ "Water For Elephants Review". Rolling Stone. 2011-04-21. Retrieved 21 April 2012. ^ "WATCH: Robert Pattinson For 'Dior Homme' (Full Commercial)". out.com. 2013-09-16. Retrieved 29 January 2014. ^ "'The Rover' Teaser Trailer – Robert Pattinson and Guy Pearce Trek Across the Australian Outback". thefilmstage. 2014-01-29. Retrieved 1 March 2014. ^ "David Cronenberg's 'Maps to the Stars' Finds Julianne Moore, John Cusack & EOne". 2013-04-18. Retrieved 4 June 2013. ^ "Berlin Film Review: Anton Corbijn's 'Life'". Variety. 2015-02-09. Retrieved 10 February 2015. ^ Bradshaw, Peter (2016-08-18). "The Childhood of a Leader review – stunning origins story for a future fascist". The Guardian. Retrieved 19 August 2016. ^ "Watch James Gray's Chanel Short Film as 'Lost City of Z' Adds Charlie Hunnam". The Film Stage. 2015-02-05. Retrieved 6 February 2015. ^ "#NYFF 2016: The Lost City of Z". 2016-10-17. Retrieved 17 October 2016. ^ "Berlinale 2017: The Lost City of Z Review". bkmag.com. 2017-02-14. Retrieved 24 March 2017. ^ "Cannes Film Review: Robert Pattinson in 'Good Time'". 2017-05-25. Retrieved 25 May 2017. ^ "Robert Pattinson Gives a Career-Best Performance in the Safdie Brothers' 'Good Time' — Cannes 2017 Review". 2017-05-25. Retrieved 25 May 2017. ^ "Watch Robert Pattinson Run Around New York City Doing a Gollum Voice and Looking for a Hot Dog". 2017-08-09. Retrieved 9 August 2017. ^ Dry, Jude (2017-08-10). "Robert Pattinson Frantically Searches for a Hot Dog in Hilarious Short — Watch". IndieWire. Retrieved 11 August 2017. ^ "Robert Pattinson Leading Zellner Brothers' Western 'Damsel'; Mia Wasikowska in Talks to Join". 2016-07-13. Retrieved 14 July 2016. ^ Stewart, Sara (2018-01-24). "'Damsel' flips the script on macho Westerns". New York Post. Retrieved 1 June 2018. ^ "Mia Goth To Star With Robert Pattinson In 'High Life'". 2015-10-23. Retrieved 26 October 2015. ^ "The Lighthouse': Robert Pattinson to Star in 'The Witch' Director's Fantasy Horror Film Based on 'Old Sea-Faring Myths'". 2018-02-15. Retrieved 1 June 2018. ^ "Robert Pattinson Announced As New Face of Dior Homme". 2013-06-12. Retrieved 12 June 2013. 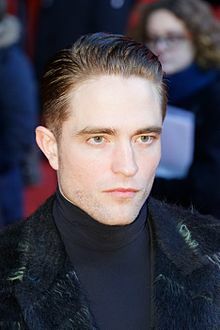 ^ "Dior Confirms Pattinson as New Face". 2013-06-12. Retrieved 12 June 2013. ^ James Rettig (2014-11-28). "New Death Grips Vinyl Reveals Robert Pattinson Played Guitar On "Birds"". Stereogum. Retrieved 28 November 2014. ^ "Robert Pattinson And Others Raise Their Hands For Charity". 2010-07-18. Retrieved 30 December 2013. ^ "Robert Pattinson's Balloon Design Goes Under The Hammer For Charity". 2010-07-29. Retrieved 30 December 2013. 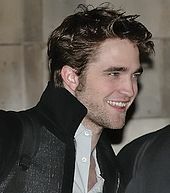 ^ "ROBERT PATTINSON AUCTIONS OFF SIGNED GUITAR FOR HOMELESS CHARITY". 2010-03-17. Retrieved 30 December 2013. ^ "Robert Pattinson Visits Children's Hospital, Does Arts and Crafts With the Kids". 2013-08-23. Retrieved 30 December 2013. ^ "Robert Pattinson steps up to the ALS Ice Bucket Challenge with the tiniest bit of ice ever". Mirror. 2014-08-20. Retrieved 15 November 2014. ^ "GQ Addresses: Robert Pattinson's Off-Kilter Bowl Cut". GQ. 2014-11-14. Retrieved 15 November 2014. ^ "The Power 1000 – London's most influential people 2013". London Evening Standard. 2013-09-19. Retrieved 23 October 2013. ^ "The 1000 - London's most influential people 2014: The Arts". London Evening Standard. 2014-10-15. Retrieved 15 December 2014. ^ "JAMIE BELL By ROBERT PATTINSON". 2015-07-20. Retrieved 20 July 2015. Henry William Dalgliesh Cavill is a British actor. He began his career with roles in the feature adaptations of The Count of Monte Cristo (2002) and I Capture the Castle (2003). He later appeared in supporting roles in several television series, including BBC's The Inspector Lynley Mysteries, ITV's Midsomer Murders, and Showtime's The Tudors. He has since appeared in numerous major Hollywood films, such as Tristan & Isolde (2006), Stardust (2007), Blood Creek (2009), and Immortals (2011). Cameron Joslin "Cam" Gigandet is an American actor whose credits include a recurring role on The O.C. and appearances in feature films Twilight, Pandorum, Never Back Down, Burlesque, Easy A, The Roommate and Priest. He also starred in the short-lived CBS legal drama series Reckless. From 2016 to 2018, Gigandet starred in the Audience Network drama series Ice. Taylor Daniel Lautner is an American actor, voice actor, and model. He is known for playing Jacob Black in The Twilight Saga film series based on the novels of the same name by Stephenie Meyer. Twilight is a 2008 American romantic fantasy film based on Stephenie Meyer's novel of the same name. Directed by Catherine Hardwicke, the film stars Kristen Stewart and Robert Pattinson. 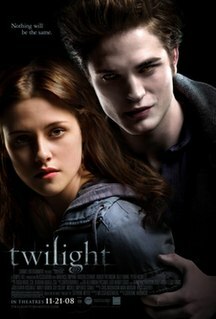 It is the first film in The Twilight Saga film series. This film focuses on the development of the relationship between Bella Swan and Edward Cullen, and the subsequent efforts of Edward and his family to keep Bella safe from a coven of evil vampires. Ashley Michele Greene is an American actress and model. She is known for playing Alice Cullen in the film adaptations of Stephenie Meyer's Twilight novels. The Twilight Saga: New Moon is a 2009 American romantic fantasy film based on Stephenie Meyer's 2006 novel New Moon. It is the second film in The Twilight Saga film series and is the sequel to 2008's Twilight. Summit Entertainment greenlit the sequel in late November 2008, following the early success of Twilight. Directed by Chris Weitz, the film stars Kristen Stewart, Robert Pattinson, and Taylor Lautner, reprising their roles as Bella Swan, Edward Cullen, and Jacob Black, respectively. Melissa Rosenberg, who handed in a draft of the film script during the opening weekend of Twilight, returned as screenwriter for New Moon as well. The Twilight Saga: Eclipse is a 2010 American romantic fantasy film based on Stephenie Meyer's 2007 novel Eclipse. It is the third installment of The Twilight Saga film series, following 2008's Twilight and 2009's New Moon. Summit Entertainment greenlit the film in February 2009. Directed by David Slade, the film stars Kristen Stewart, Robert Pattinson, and Taylor Lautner, reprising their roles as Bella Swan, Edward Cullen, and Jacob Black, respectively. Melissa Rosenberg, who penned the scripts for both Twilight and New Moon, returned as screenwriter. Filming began on August 17, 2009, at Vancouver Film Studios, and finished in late October, with post-production began early the following month. Bryce Dallas Howard was cast as Victoria, replacing Rachelle Lefevre who previously played her. Xavier Dolan-Tadros is a Canadian actor, director, screenwriter, editor, costume designer, and voice actor. He began his career as a child actor in commercials before directing several arthouse feature films. He first received international acclaim in 2009 for his feature film directorial debut, I Killed My Mother, which premiered at the Cannes Film Festival in the Director's Fortnight section. The Twilight Saga is a series of five romance fantasy films from Summit Entertainment based on the four novels by American author Stephenie Meyer. The films star Kristen Stewart, Robert Pattinson, and Taylor Lautner. The series has grossed over $3.3 billion in worldwide receipts. The first installment, Twilight, was released on November 21, 2008. The second installment, New Moon, followed on November 20, 2009, breaking box office records as the biggest midnight screening and opening day in history, grossing an estimated $72.7 million. The third installment, Eclipse, was released on June 30, 2010, and was the first Twilight film to be released in IMAX. David Michôd is an Australian film director, screenwriter, producer and actor. He is best known for directing the critically acclaimed crime drama Animal Kingdom (2010) and dystopian drama The Rover (2014). He also co-wrote Hesher (2010). 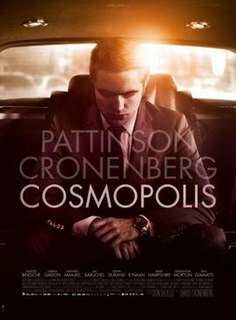 Cosmopolis is a 2012 drama-thriller film written, produced, and directed by David Cronenberg and starring Robert Pattinson in the lead with Paul Giamatti, Samantha Morton, Sarah Gadon, Mathieu Amalric, Juliette Binoche, Jay Baruchel and Kevin Durand. It is based on the novel of the same name by Don DeLillo. On 25 May 2012, the film premiered in competition for the Palme d'Or at the 2012 Cannes Film Festival, drawing mixed early critical reactions. The film was released in Canada on 8 June 2012, and began a limited release in the United States on 17 August 2012 by eOne Films. It is Cronenberg's first foray into script writing since 1999's eXistenZ. Taissa Farmiga is an American actress. She began her career in film in the drama Higher Ground (2011) which was directed by her sister Vera Farmiga, and subsequently made her television debut in the FX series American Horror Story: Murder House (2011), which earned her a reputation as a contemporary scream queen. She then appeared in three other seasons, Coven (2013), Roanoke (2016), and Apocalypse (2018). The Twilight Saga: Breaking Dawn – Part 2 is a 2012 American romantic drama fantasy film directed by Bill Condon and based on the novel Breaking Dawn by Stephenie Meyer. Constituting the second of a two-part adaptation of the novel, the film is the fifth and final installment in The Twilight Saga film series, following 2011's Breaking Dawn: Part 1. All three main cast members, Kristen Stewart, Robert Pattinson, and Taylor Lautner, reprise their roles, with Mackenzie Foy portraying Renesmee Cullen. Alongside Pattinson, Lautner, Stewart, and Foy, the film also stars an ensemble cast including Billy Burke, Peter Facinelli, Elizabeth Reaser, Kellan Lutz, Nikki Reed, Jackson Rathbone, Ashley Greene, Michael Sheen, and Dakota Fanning. 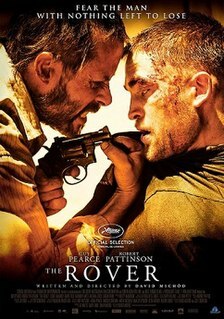 The Rover is a 2014 Australian dystopian drama film written and directed by David Michôd and based on a story by Michôd and Joel Edgerton. It is a contemporary western taking place in the Australian outback, ten years after a global economic collapse. The film features Guy Pearce, Robert Pattinson, and Scoot McNairy with Anthony Hayes, Gillian Jones, Susan Prior, Nash Edgerton, David Field and Tawanda Manyimo. It premiered out of competition in the Midnight Screenings section at the 2014 Cannes Film Festival on 18 May 2014. Maps to the Stars is a 2014 internationally co-produced satirical drama film directed by David Cronenberg, and starring Julianne Moore, Mia Wasikowska, John Cusack, Robert Pattinson, Olivia Williams, Sarah Gadon, and Evan Bird. The screenplay was written by Bruce Wagner, who had written a novel entitled Dead Stars based on the Maps to the Stars script, after initial plans for making the film with Cronenberg fell through. Life is a 2015 biographical drama film directed by Anton Corbijn and written by Luke Davies. It is based on the friendship of Life photographer Dennis Stock and Hollywood actor James Dean, starring Robert Pattinson as Stock and Dane DeHaan as Dean. Good Time is a 2017 American crime film directed by Josh and Benny Safdie and written by Josh Safdie and Ronald Bronstein. It stars Robert Pattinson as a bank robber on the run with his developmentally disabled brother ; Barkhad Abdi, Jennifer Jason Leigh, and Buddy Duress co-star. The original soundtrack was composed by electronic musician Oneohtrix Point Never.